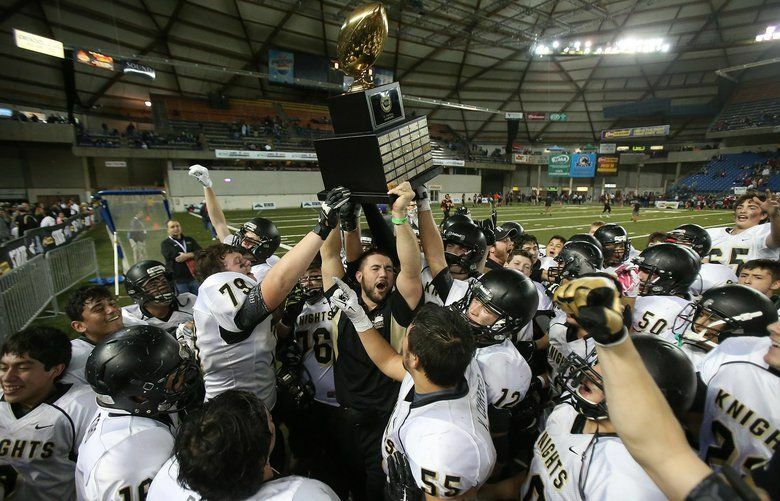 Assistant Coach Jeremy Scroggins holds the championship trophy after the class 1A state title football game between Royal High School and King’s School, Saturday, December 5, 2015, at the Tacoma Dome. Royal defeated King’s, 28-7. The Executive Board made a one-year commitment to try a new method in deciding who plays who in state tournaments. The Washington Interscholastic Activities Association’s Executive Board voted Sunday to create committees to seed the 2018 state football field. The board approved a plan created in April from a committee formed to study the use of Rating Percentage Index in seeding state tournaments for all sports. RPI has been used to seed the state basketball tournaments the last two seasons. But after studying how RPI would have seeded last year’s football tournament, the state coaches’ association gave it a pass. “They’ve been wanting somewhat of a human factor,” said Greg Whitmore, Executive Board member and RPI committee head. Most details of how the committee will work will be decided in the summer. Those interested will be able to apply for one of three committees: one for the 4A and 3A classifications, one for 2A and 1A and one for 2B and 1B. Whitmore, the athletic director for Lind/Ritzville High, said he envisions 8 to 10 people per committee. The committee will seed the state field of 16 teams. For 4A and 3A, that means after teams qualify for state after playing in the preliminary playoff round. The committee won’t pick who is in the tournament, it will just seed the teams in it. The committee will be evaluated after the season to see if it will continue beyond 2018. • The RPI committee also decided not to use RPI for volleyball or soccer for the next school year. It could be used in future years. It’s still studying RPI for baseball and softball. • RPI for seeding state basketball will be tweaked to something called the 40/40/20 formula, meaning 40 percent is based on win/loss percentage, 40 percent is opponent’s win/loss percentage and 20 percent is opponents’ opponents’ win-loss percentage. Previously RPI was decided on a 25/50/25 formula.